Cake originally made for Boo in January 2010. 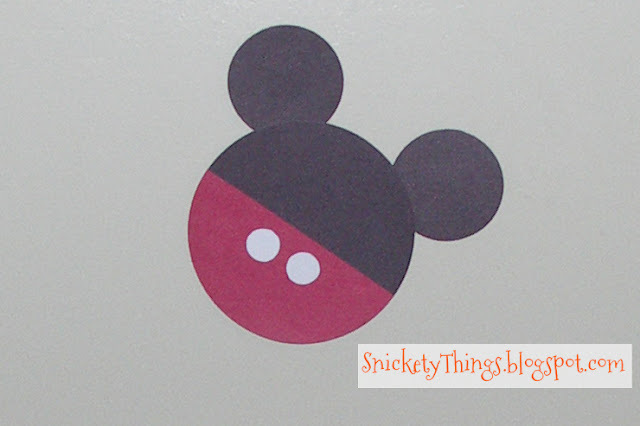 When I asked my youngest what she wanted as a theme for her third birthday I was surprised when she said Mickey Mouse. After all, she had a Mickey Mouse theme the previous year. I wasn't going to rock the boat since she seemed so excited about it. I started making up invitations by gluing two black two inch circles to a black 4 inch circle. I also punched some red four inch circles and cut them in half. I punched out some buttons in white. On the back, I just printed out the party details on label paper and stuck it to the back. The left over invitations were used as wall decorations. I'm sorry these pictures are so dark. I tend to make my cakes at night so I never have decent light. I'm sure I saw these on the internet at some point, but I have no idea what the site was I saw them on and it has been over two years. Since making these, I have seen this style in a lot of places. At the last minute I decided this would be an easy cake design to make. I went with four six inch cakes and two ten inch cakes. I stacked them, put them together to be iced. 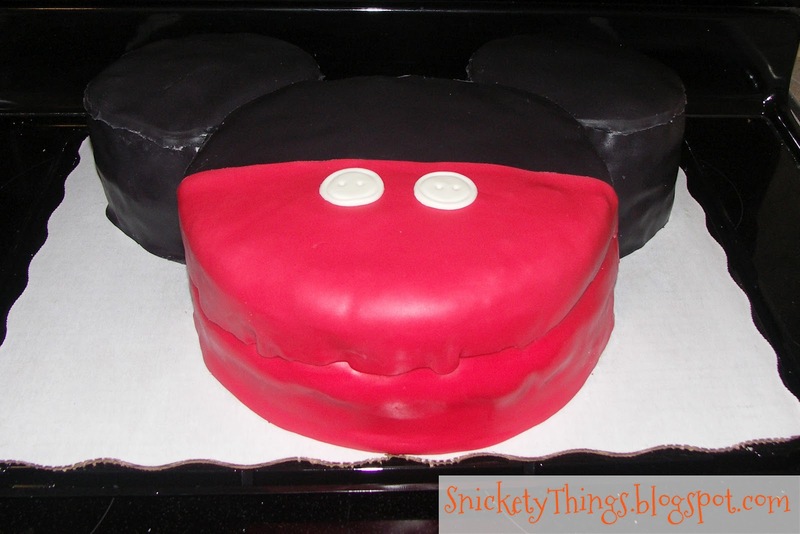 I looked at the size of the cake and realized how much red and and black icing there would be and how much tint it would take to get those colors, and even if I did everyone would have black or red teeth for the rest of the day. I decided to use fondant so I just iced the entire thing in white. I'm not very fond of the taste of store bought fondant. I really haven't found anyone who is. I decided to use marshmallow fondant because I heard it tasted much better and was easier to work with. I did a quick internet search for a recipe and sent my hubby to the store for marshmallows. That should have been my first clue that things wouldn't be going quite as easily as I would hope. He got back and I started making up enough to cover my cake. I had never used marshmallow fondant before and I struggled with it. It was already 10pm the evening before the party so I just kept going. I really hoped to get the fondant all in once piece to cover the portions of the cake it was supposed to, but I gave up and cut it into pieces. The fondant kept drying out on me and I couldn't get the edges to blend well. I used my six inch cake pans to "punch" the circles out of the fondant to lay over the ears, and did the same with the ten inch pan to cut a half circle for the larger portion. I have rolling fondant cutter I was able to use to cut one long strip out that went around the edge. The only thing at this point I was happy about was that the fondant took the color so well. See the edge around the ears? I could not get that to blend no matter what I tried so I just decided that was what I intended to do. I also noticed that I had tried to blend until my fondant looked lumpy on the cake. After all that trouble on the black portion you would think I would just do the same thing for the red, right? Nope, I was still determined to have it go on in one piece. After completely destroying the fondant, I made up some more and just let it go on in pieces also. I had intended to cut the circle out again with the pan, but my strip wasn't quite tall enough to go to the top of the cake (the nerve!) even though I had not adjusted the width of my fondant cutter. I et the top drape over the edge. For those button I just cut a couple of circles out with the large side of one of my gigantic tips and cut the smaller circles out with the tip of a round tip. Here it is set out for the party. I chose yellow star shape candles to keep with the red.black/white yellow color scheme of the party. If you notice, I also had some small yellow stars sprinkled around the table along with Mickey silhouettes and buttons. In hindsight, I should have used the fondant I was used to using instead of trying something new the night before the party. Learn from my mistakes. The birthday girl was not disappointed so it was an overall success. adorable! i love it!...and i'm sure the kids will too. .....and i have never worked with fondant before-its on my "to do" list. Thank you! Good luck with the fondant. We have a love-hate relationship. Thank you, and for the invite, too! Really cute cake. 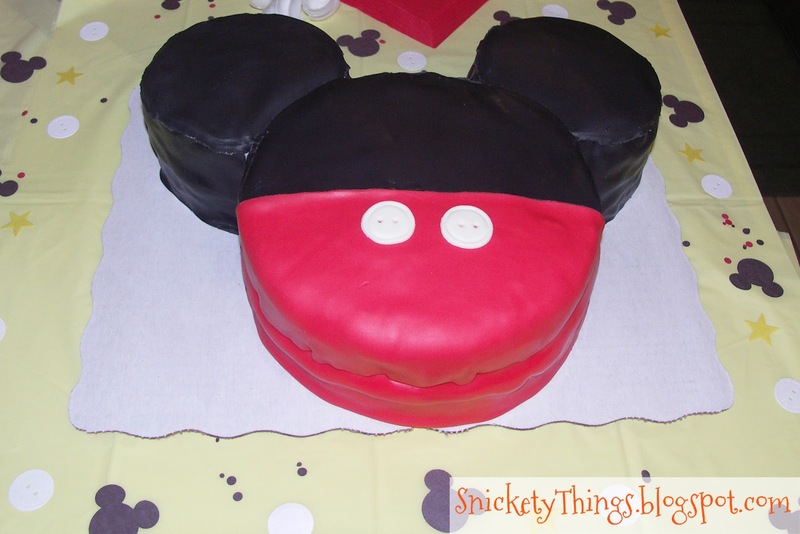 I've done a Mickey Mouse cake too. It's such great inspiration. I think you did a great job! Your fondant looks great, at least to me:) And I bet the party girl was thrilled, way to go mom! What kid wouldn't love that??!! Adorable! 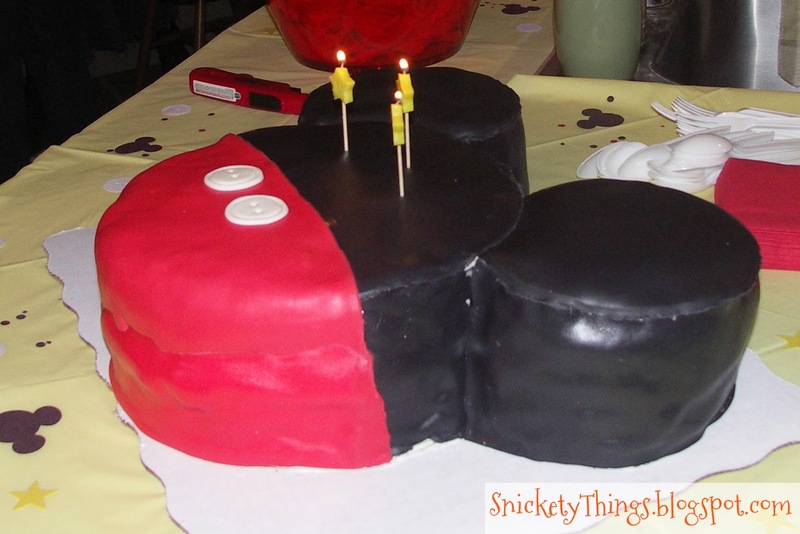 Adorable cake, thanks for linking up to Show Your Stuff! I think we are our own worst critics. It looks amazing! The cake looks wonderful. I hope her party was fun for everyone. Thank you! The kids had a lot of fun. I will have to try working with fondant again soon. I haven't had a need lately. Just beautiful cake, and I really like your creativity! What a cute cake! I found you on the network blog hop. Glad I did! I'm following you on gfc and I'd love for you to come visit my blog sometime. Thank you! I will come and check you out. How awesome! My daughter is in love with Mickey! She would love this! I'm going to have to try for her birthday! Thank you! I will have a look at your blog. Love the cake! 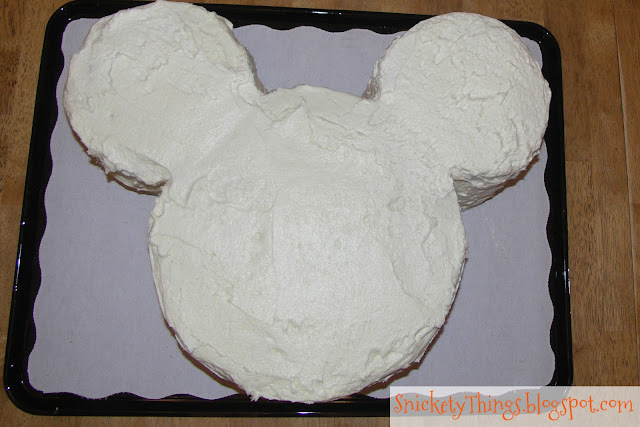 I just made a Minnie Head for my DD's 2nd bday and used icing.. I still have a purple tongue from all the black. The fondant looks awesome! Great job. Thanks! That was why I was so afraid to use the black and red icings. Your black MMF looks fantastic! What did you do to make it black? Thank you! I just used the Wilton black icing color. It took quite a bit of it though. Your cake is amazing! Great job! THanks for linking to Handmade Tuesdays! I am pinning this because my little girl is a Disney freak, and will want a Mickey party soon! Thanks! Thank you, and thanks for the pin! That cake is super cute. I love how it came out. Thanks for sharing at DIYbyDesign. We did a Micky Mouse Clubhouse Riley's 1st birthday and then Minnie Mouse for her 2nd birthday. She adores them! Your cake came out great. Especially since it was your first time with fondant. When I made Riley's cake I had butterflies in my stomach that I was going to mess it up. Like a two year old would have noticed! Thanks so much for sharing at Whimsy Wednesdays. Thanks! 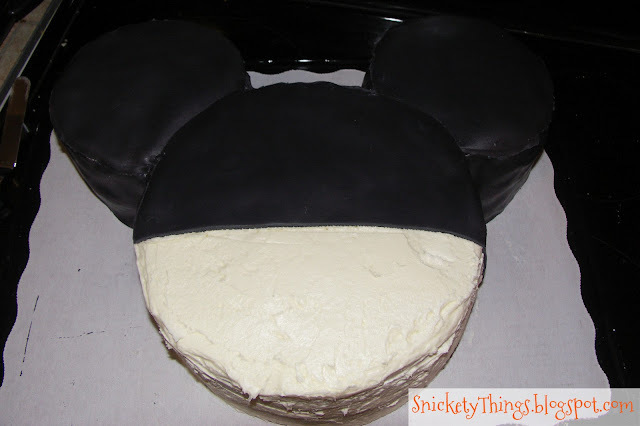 Boo wants a rainbow zebra Mickey Mouse cake next year. It should be interesting. Amazing! Especially since you were trying something new.